The deeper malady beneath the Dengvaxia fiasco is being buried under the lies, theatrics and hypocrisy of various elements in the ruling and privileged classes of the present unjust and oppressive social system. The proximate cause of this Dengvaxia fiasco is corporate hijacking of the health care system with the complicity of governments, international institutions (e.g. the World Health Organization) and mainstream medicine. Profit became the primary driving factor in addressing a public health problem, not public welfare as some doctors still want to believe. Sanofi-Pasteur, the embodiment of Big Business, seeing multibillon-dollar profits within reach and under pressure by neoliberal business competition, pushed hard for the approval and marketing of their product despite the obvious lack of scientific and commonsensical justification and total disregard of public welfare. Sanofi knowingly concealed their own finding that Dengvaxia could cause severe dengue in seronegative child recipients. They made it appear that they learned only of this finding in November 2017 when in fact their sponsored study published in September 2015 already revealed this potential danger. The WHO is also clearly complicit in the criminal behaviour of Big Pharma. Contrary to its pronouncement in 2017 that it did not recommend the use of Dengvaxia, the WHO Strategic Advisory Group of Experts (SAGE) with at least two of its members connected to Sanofi, already recommended in March 2016 the use of Dengvaxia for mass vaccinations in highly endemic countries. In fact, the WHO has been a partner of Big Pharma in developing the vaccine. Before the mass vaccination in July 2016, other experts have already questioned the interpretation of the results of the supporting study by Sanofi and warned that it was too early to use Dengvaxia for mass vaccination since there was no sufficient safety data yet. Nonetheless, government officials at that time proceeded with the mass vaccination with the blessing of WHO. Meanwhile, the public was blind-sided and was duped into accepting the vaccination program of the government. Lamentably, some privileged members of the medical profession who knew or who should have known about the rushed transactions and the lack of sufficient safety data were silent when their voices were badly needed by the endangered potential vaccinees. When the scandal broke out, political opportunism and grandstanding under the guise of inquiry took its turn and the truth became even more muddled. Some doctors are now decrying “unsubstantiated accusations by persons whose qualifications to render any expert opinion on the matter are questionable at best…”, implying that only “experts” should speak out and be listened to. They also decry the erosion of public confidence in government vaccination programs and as a result, presumably jeopardising public health. However, the same doctors have implicitly supported the position of Sanofi in the controversy which, in fact, already endangered public health. Interestingly, some of these doctors are intimately connected with Big Pharma. 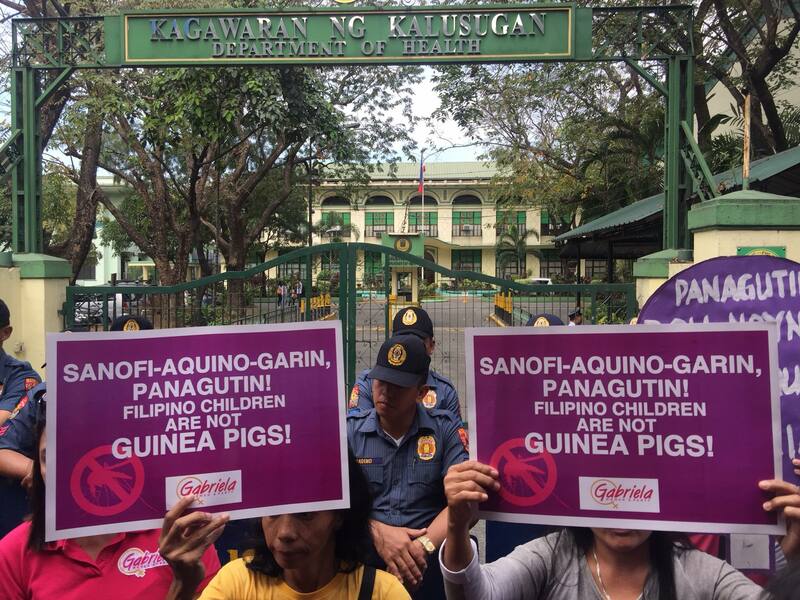 Protest of Dengvaxia victims in front of the Department of Health. Photo by Kathy Yamzon/ Manila Today. There is good reason to believe that doctors are downplaying the hazards and exaggerating the benefits of vaccination because of conflict of interest, Big Pharma conditioning, or inappropriate medical education. Even highly competent and well-meaning experts can be misled by the corporate dominated health system. The inherent danger of injecting microbial protein fragments, DNA and other foreign materials into the human body, especially in children, is well documented in the scientific literature. Dengvaxia, and in fact, all vaccines, contain such hazardous foreign fragments and materials. Investigating the potential adverse effects of Dengvaxia should not be limited to deaths associated with contracting the dengue virus but should be more comprehensive in nature. There are many plausible biological mechanisms for potential adverse effects due to Dengvaxia. Triggering a more severe dengue disease in seronegative children through antibody dependent enhancement or similar mechanism is just one. Synergistic harmful effects, especially to the immune system, due to concomitant exposure to other vaccines is another plausible mechanism of potential adverse effects, particularly in young children. Aggravation of vaccine adverse effects with exposure to other environmental hazards (e.g. pesticides) is also another plausible mechanism that may result in acute or long-term injury, including death. All these have been documented in the scientific literature and should not be ignored. There is also very little information about potentially hazardous foreign materials present in the vaccine. Trometamol, an alkalinizing agent used in various industrial products and cosmetics, is listed by Sanofi-Pasteur as an ingredient but with very little toxicologic information available. What is more of concern is that the Dengvaxia vaccine is produced through genetic engineering technology with uncertain but potentially serious hazards. Long-term, comprehensive monitoring, care and indemnification of those who were oppressively vaccinated with Dengvaxia should be put in place. Historically, scientific findings on the adverse effects and potential serious hazards of vaccination have been ignored or downplayed by mainstream medicine and the dominant institutions (WHO, US Centers for Disease Control and Prevention) giving directions to government policies regarding vaccines and health care. This is not surprising since the advisory committees of these institutions are stacked with Big Pharma “experts”, some of whom even occupy high positions and shuttle back and forth between government and industry (revolving door phenomenon). It must be pointed out that the only “scientific studies” supporting the use of Dengvaxia are those studies done by the one who sells the vaccine, Sanofi. Given the dubious record of Sanofi and Big Pharma for fraud and other forms of criminal behaviour, there is good reason not to trust the results of their studies. It is high time that this Dengvaxia controversy, and for that matter issues regarding other vaccinations, be subjected to public scrutiny and oversight. The public has good reason to be alarmed. The credibility and acceptability of government health programs has been steadily eroded due to myriad reasons — low budget priority, deteriorating services, privatization of hospitals and growing inaccessibility of good medical care. Now add the horror of a mass vaccination program that has endangered the lives of innocent, especially young, vaccinees. There must be accountability of all those who pushed for the Denvaxia mass vaccination program of government both in the Aquino and Duterte administrations. Sanofi must be penalized for its unethical, even criminal practices, that led to this fiasco. But more immediately, the Department of Health under the current administration must put in place a system by which Dengvaxia vaccinees can be closely monitored, health promotive measures are instituted even before they get sick, immediate and adequate medical attention is rendered should they get sick, and continuing research done to determine the cause-and-effect relationship of Dengvaxia vaccination to these illnesses and even deaths. Politicians and government functionaries using the Dengvaxia issue to score “pogi”points with the public by appearing to champion the cause of the children placed in harm’s way but who only manage to generate more heat than light; those with an ax to grind against their political enemies; or those wittingly or unwittingly protective of Sanofi because of their ties with it and the pharmaceutical industry as a whole — they must be taken to task. People’s trust in government health programs cannot be earned by hiding or obscuring the facts and insisting that “experts” alone can speak authoritatively on the issue. The people have good reason to resist government health programs that do not live up to their mandate of serving the people. Only when health is in the hands of liberated and empowered citizens will public health programs be truly beneficial to the people.